iMacsoft DVD to Apple TV Suite, all-in-one DVD to Apple TV Converter and Apple TV Video Converter suite, is designed just for Windows users. It allows you to fast rip DVD movies and convert videos to Apple TV video formats MP4, MPEG-4, H.264. The Suite includes two professional products: DVD to Apple TV Converter and Apple TV Video Converter. iMacsoft DVD to Apple TV Converter, as professional DVD to Apple TV converter, can convert DVD to Apple TV video formats MP4, MPEG-4, Apple TV audio formats MP3, AAC, WAV and put DVD on Apple TV with super high speed and excellent image and sound quality! 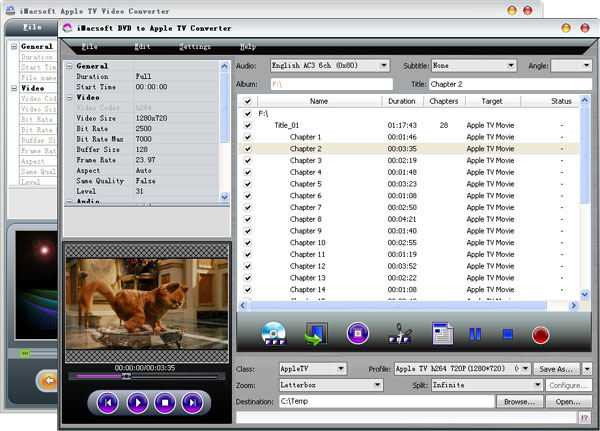 iMacsoft Apple TV Video Converter, as powerful Apple TV Converter software, can convert most popular videos such as AVI, DivX, XviD, WMV, MPEG, DAT, VOB, RM, RMVB, MOV, ASF, etc. to Apple TV video format MP4, MPEG-4. In additional, iMacsoft Apple TV Video Converter can convert popular audio files including WMA, MP2, OGG, RA, AC3, CDA to Apple TV MP3, AAC. Now free download and try this powerful iMacsoft DVD to Apple TV Suite. Enjoy your favorite movie clips on Apple TV with your friends and folks. Don't	hesitate; purchase this product with your precious savings! Provide two personalized skins for your choice. iMacsoft DVD to Apple TV Converter, as professional DVD to Apple TV Converter, can convert DVD movie to Apple TV video formats MP4, MPEG-4, Apple TV audio formats MP3, AAC, WAV and put DVD movie on Apple TV with super high speed and excellent image and sound quality! iMacsoft Apple TV Video Converter, powerful Apple TV Video Converter, can convert most popular videos such as AVI, DivX, XviD, WMV, MPEG, DAT, VOB, RM, RMVB, MOV, ASF, etc. to Apple TV video formats MP4, MPEG-4. Otherwise, iMacsoft Apple TV Video Converter can convert popular audio files including WMA, MP2, OGG, RA, AC3, CDA, etc. to Apple TV audio formats MP3, AAC.